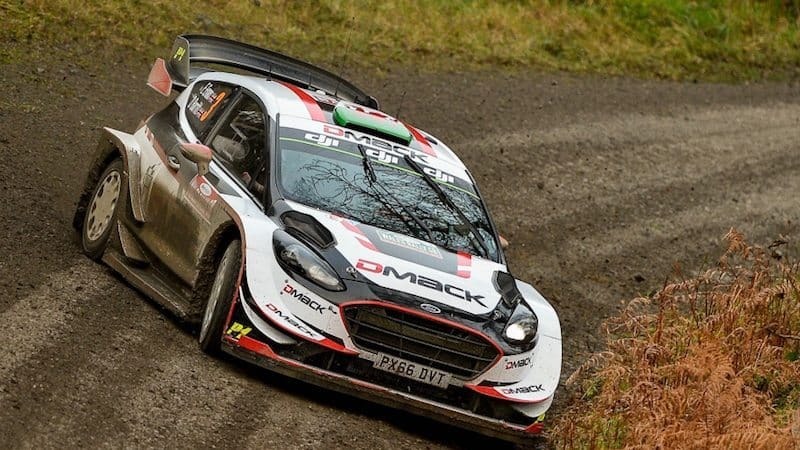 Elfyn Evans won last year's Wales Rally GB using DMack tyres on his Ford Fiesta. A total of only 60 entries have been accepted for Wales Rally GB (4-7 October), the eleventh round of the FIA World Rally Championship. This number includes 11 cars accepted under special National Car rules for non homologated cars, and around 10 drivers who are competing for the concurrent final round of the national British Rally Championship. With only two cars entered by Citroen Racing (Ostberg and Breen) there are only 11 World Rally Cars, and four cars entered in WRC3. There are 14 cars in WRC2. A total of 24 R5 cars are entered, almost half the fully homologated car entry. In the ongoing battle for the WRC2 title, Skoda Motorsport has entered only Pontus Tidemand for his sixth out of seven permitted entries this year (his rival Jan Kopecky, the championship leader, has entered five to date and has won each time). The team has not yet announced their plans for entries in the two remaining WRC rounds. It is reported that around 80 crews have entered the national supporting event which is held over the first two days of the WRC event. See the full Wales Rally GB entry list HERE.